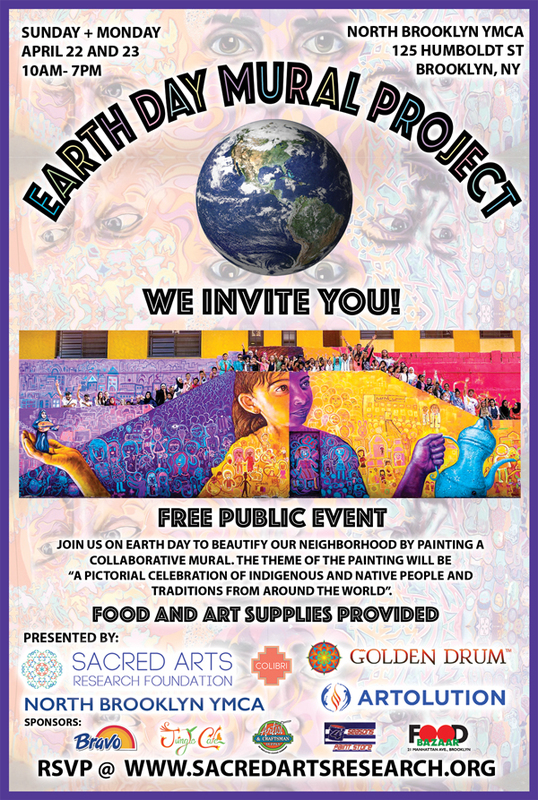 On Earth Day, April 22nd, as well as April 23rd our organization will be partnering with Artolution, The Golden Drum, M.A.I.S.C and the YMCA of North Brooklyn to create a collaborative mural! This event will take place at the North Brooklyn YMCA Eastern District Center at 125 Humboldt Street at the corner of Boerum St. from 10am-7pm on April 22 and 23 (note new address). This community mural project will be a free public event for families to attend and participate in the completion of a public work of art. By establishing a visual public presence, we hope that the local community will join us in investing in the beautification and education of our city’s future. The theme of the mural will be a pictorial celebration of indigenous and native people & culture from around the world. We invite YOU! Your families, schools and communities to join us in this awesome event! If you would like to get involved and join us please RSVP by filling out the form below! Your RSVP helps us make sure we are equipped with enough food and supplies for this event. Please let us know if you won't be joining us! Thank you for registering!